1 Add all ingredients into the blender except olive oil. 2 Pulse as best as possible then add in olive oil and blend until smooth. 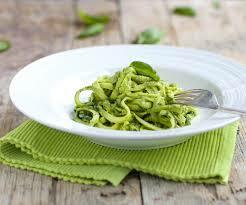 3 Next add the courgette noodles into a pan and sauté on medium heat for 2-5 mins until lightly cooked. Add the pesto and top with protein of your choice. 4 Keep the extra pesto in a plastic container in the fridge with the avocado stone to prevent browning and cover with a lid.